Alright...I've been hand-washing dishes with environmentally friendly dish soap for over 2 years now. I'm tired of it. And after reading up on dishwashing detergents (why they do and do not work), I have come to the conclusion that the reason my dishwasher was not working is because of the detergent I was using. The eco-friendly versions have a tendency to not work. They are phosphate-free, bleach-free, and generally just too weak to handle tough cleaning. So, you end up running them through the dishwasher and then re-washing half of them afterward. A big waste of water and time. I am a huge proponent of balance and simplicity. And while I definitely care about the planet...I also care about my time. Washing dishes every night for up to 30 minutes just isn't my idea of time well spent. And if I can manage to get the job done without using much more water or hurting the environment, then that is the plan. Sometime in 2010, a new law went in to effect that limited the amount of phosphates allowed in dishwashing detergent formulas. Those of us who weren't aware of this may have suddenly thought our dishwashers were done for. I certainly did...which is why I switched to handwashing (to avoid double-washing my dishes). 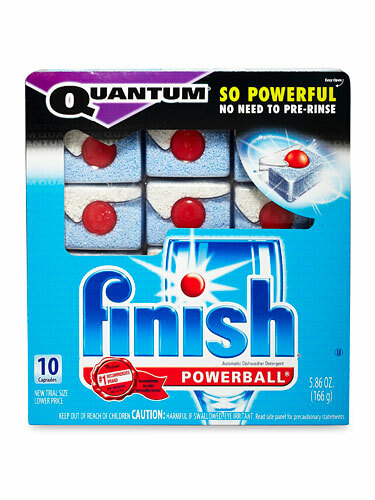 Cascade All-in-One (28 cents per load), Cascade with Dawn ActionPacs (23 cents per load), Finish Quantum (30 cents per load), and Finish Powerball Tabs (23 cents per load) rated highest with Consumer Reports. They were quick to mention, also, that you didn't have to have phosphates (which encourage algae growth) or bleach (which can harm a septic tank) to get the job done. 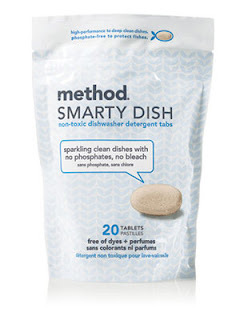 They recommended Method Smarty Dish Detergent and Simplicity (both a bit more expensive, as would be expected, than the low-phosphate brands). CR also found that bleach did little to improve the cleaning ability of the detergent, but enzymes seemed to help. I found Finish tablets at Costco. The price was right, and since they are safe for the septic system, earn relatively high consumer ratings, and are low in phosphates and include enzymes without bleach...I'm giving it a go. My 30 minutes of time each night is worth more to me than a few gallons of water (because honestly, I don't think handwashing made much of a difference in our overall water usage). The bad news...Finish is not listed as a "Cruelty Free" product. But Method is. So, I suppose if this whole dishwasher experiment works out...I will probably search out the Method tablets. After reading several reviews on all of the CR-endorsed products, I have found that both the Method and Simplicity received more positive AND more negative reviews than either of the main-stream brands. The Finish Quantum received almost all 5-star ratings on Amazon. Hmmm...we'll see.